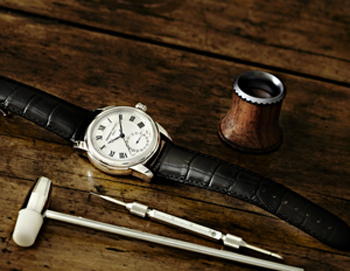 The well-known watch company Frederique Constant is the novelty Classics Manufacture, made in two versions: with stainless steel (Ref. FC-710MC4H6) and the housing of gilded steel (Ref. FC-710MC4H4). New made in a classic elegant style. Case Diameter – 42 mm. Silver guilloche dial in the center, has Roman numerals and three arrows. Hour and minute of them are decorated with “Breguet apples.” In “6:00” is a date window with Arabic numerals and a small arrow. It protects the dial sapphire crystal, which is set on the back of the model. New Classics Manufacture manufactory is equipped with an automatic caliber Frederique Constant FC-710 at 26 stones, with a frequency of 28,800 vibrations per hour, 42-hour power reserve, functions: hours, minutes, seconds, date. Model comes on a leather strap black with folding clasp in stainless steel. 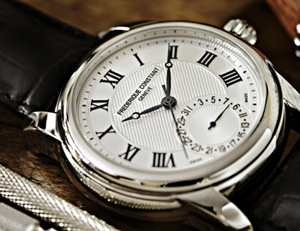 Buy watches Classics Manufacture of Frederique Constant is possible for $ 2250 (with stainless steel) and for 2550 $ (with a gilded frame).